Sri Krishna is the Lord of Lords.He is PARAMESWARA.He is embodiment of Sachidananda.as He is the cause of causation. He is the beginning of the beginning. To the Prakrithi( the Nature ) and to the dweller in the Prakrithi He is the Master. He is the repository all Gunas(traits). The creation, sustenance and destruction of the Universe are His passive play. That he is engaged in RAS (passively) with each and every being. His compassion renders the Jeeva who is captive in the Prakrithi of Three Gunas, an opportunity to unshackle himself and to elevate to the Divine planes. The faculty of Human Body, is a rare gift to the dweller in the Prakrithi. Because this Body is extremely suitable for experiencing inwardness (Antarmukhatva) and the Divine Consciousness. Out of arduous effort and out of the Grace of the Divine the Human gets the devotion of Sri Krishna. When the sinfulness is waning due to thousands of births consisting of Tapas, Dhyan and Samadhi, dawns the Devotion of Sri Krishna in the life of the Being. So rare event is the devotion of Krishna in the journey of the Soul in the Prakrithi. Even among those fortunate realised souls, those who understood and realised My 'Thatvataha' swaroop are rare. The Lord in His inner abode is in the incessant worship of Radha or Rasa. The Lord out of his compassion up on the devoted Jeeva reveals His Tatvataha swaroop. Such fortunate jeeva will worship Radhaji. Sri Radha and Sri Krishna are not two. They are one and the same. The Rasa has manifested as Radha and Krishna for the sake of Leela. 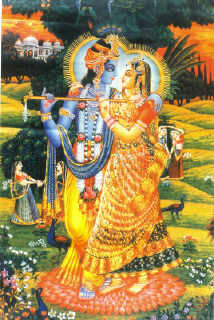 Sri Krishna brings Jeeva to Radha. And Radhaji bestows Rasa to the Jeeva.